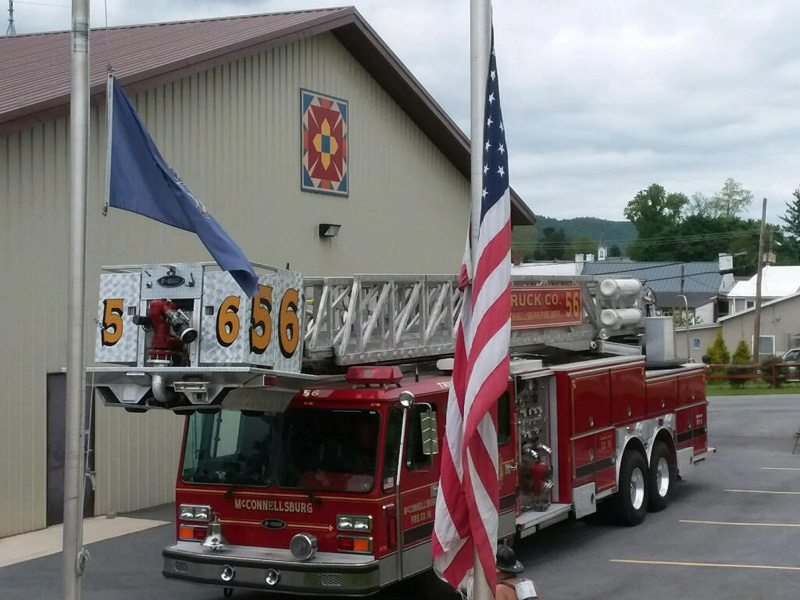 McConnellsburg Volunteer Fire Co. 56 proudly displays their Barn Quilt on the East end of the Fire Building on S 3rd St.
Our design with The Maltese Cross is a symbol of Protection and Badge of Honor. MVFC was formed in 1930 and housed in the building where Jesse Toppers office is located and then moved beside the Antietam Iron Works Building. In 1955 MVFC was moved to its current location on Maple St and 2007 an additional building was built to house the fire equipment. MVFC proudly continues the tradition that was put forth by all the men and women that have served since the beginning. It is our pleasure to be a part of the Barn Quilt displays and invite the Community to visit our Station .